Golden Start is a reading and math program which goes beyond academics and promotes Christian values through a Golden Rule philosophy. We use the Creative Curriculum. 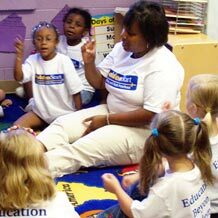 The Creative Curriculum is recognized as one of the best preschool curriculum in the nation. It is a student-driven curriculum which allows us to work with students at their individual pace. Our classrooms are designed around a center-based learning strategy with age appropriate activities. We will meet the social, emotional, physical, and language developmental needs of your children. In addition, our program prepares your child for school by teachings independence, self-help skills, and the ability to follow 3-step directions. It is vitally important to us that our program have an equally strong Christian value program. In addition to the academic program, each classroom has age-appropriate Chapel time. Click here for the Parent Handbook to learn about our policies, procedures and fee schedule. I could not have asked for a better school for my daughter. Every single person that works there is incredibly kind, caring and nurturing. The curriculum is fantastic, and my daughter has learned so much. I can't say enough wonderful things about Golden Start and highly recommend it to anyone looking for a preschool in the Smyrna area. It is the best!